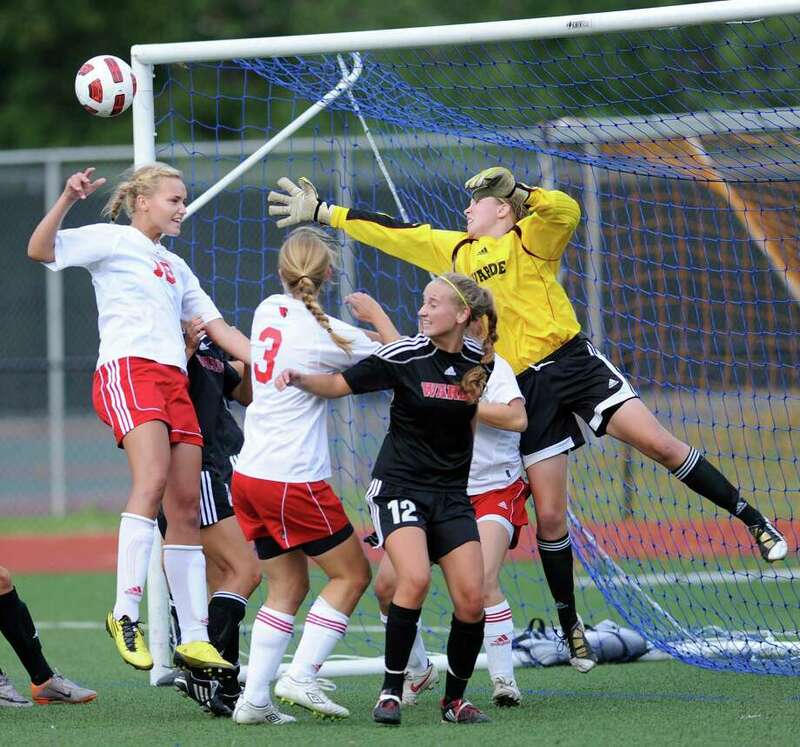 All-FCIAC goalie Katie Brennan, in yellow, reaching for the ball, again backstops a strong Fairfield Warde defense that has the Mustangs expecting big things in 2013. Let there be no doubt what the Fairfield Warde girls soccer team's goals are for 2013. The Mustangs return seven starters from the team that was 10-3-3 a year ago -- a squad that did not allow a goal until its 10th game. Head coach Tom Cunningham is confident and aware that this should be a successful year. "This is definitely not a rebuilding season," Cunningham said. "This is a year we feel we should compete." The club is spearheaded by captain and returning three-year starter in goal, Katie Brennan. Brennan is a two-time, first-team All-FCIAC selection, and with a strong group of returning defenders -- including fellow captain and stalwart three-year starter Julia Delaney -- the Mustangs' defense is again a strength. In the midfield, Megan Overby and Sarah Reilly each return, with Overby serving as a captain. Junior Virginie Larouche and freshman Anna Glovin will help serve the ball to standout scorers Nell Carpenter and Jenn Maldenado. Though it was unbeaten and unscored upon through 10 games last year, injuries conspired to doom Warde's postseason's aspirations. The Mustangs were 3-5-1 in their final nine games, including an upset loss to Westhill in the Class LL state tournament's first round. Yet, with experience and enhanced depth -- Cunningham believes he can sub in any of eight players and not have a drop off in performance -- Warde should be able to have a better finish than last year. "We have a lot of depth in the midfield and at forward," Cunningham said. "We definitely have the numbers to keep fresh legs out there." So all that is left for Cunningham and Warde is to fend off the pressure and live up to the expectations the club has set for itself. "I put a lot of pressure on myself and on my staff," Cunningham said. "They want to have a better season than last ... I think we can be a better team than last year. So what do we have to do to reach that point?" The coach has an idea of the answer to that question. He will place a challenge on his players to accomplish the little things along the way that when taken together can lead to attaining the primary goal.